This is my take on a classic dish. To make the batter, sift the flour into a bowl. Make a well in the centre and add the sparkling water until you have achieved a smooth batter and store in the fridge. Dust the strips of fish in a light coating of GF flour and then dredge in the batter, shaking off any excess. Deep-fry for about 5 minutes or until cooked through and golden brown. You may have to do this in batches depending on the size of your fryer. If you are cooking larger pieces of fish start cooking it in the fryer and then transfer to the oven to finish cooking. 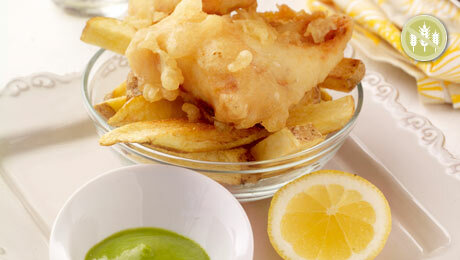 Serve the fish and chips in little newspaper cones and enjoy. In a large saucepan quickly fry off the onion & garlic until browed. Add in cream and cook until the peas have softened and the cream will have reduced and thickened - approx 5 minutes. Mix in the seasoning and freshly chopped mint at this stage. Transfer the entire mixture to a food processor or blitz with hand held blitzer until broken down but still a little chunky. Serve with the fish and some home made thickly cut chips. The yeast should have been added in with the flour, for use in the batter. Would this recipe work if the fish was mid defrost? We would not recommend using half defrosted fish, we would recommend that the fish defrosts in the fridge overnight. There is risk of the fish being undercooked and the result would definitely not be as good. What was the yeast for?